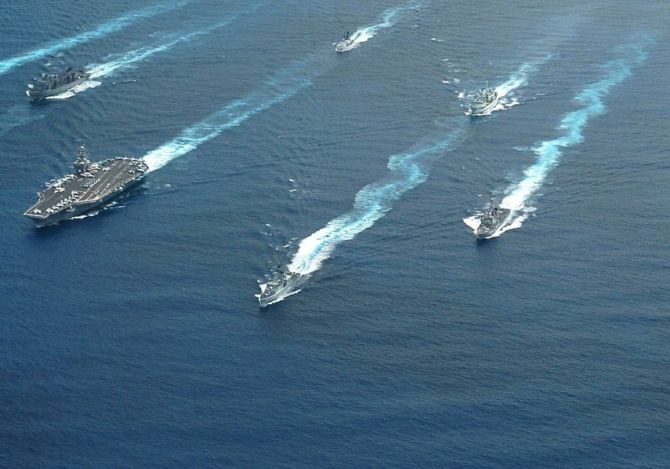 Alleging that Beijing is engaged in "destabilising behaviour" in the South China Sea, the Pentagon has kicked out China from its annual maritime military exercise. Asserting that the United States is committed to a free and open Indo-Pacific, the Pentagon said China's continued militarisation of disputed features in the South China Sea only serve to raise tensions and "destabilise" the region. "As an initial response to China's continued militarisation of the South China Sea, we have disinvited the PLA Navy from the 2018 Rim of the Pacific Exercise. China's behaviour is inconsistent with the principles and purposes of the RIMPAC exercise," Lt Col Christopher B Logan said. The Department of Defense, he said, has strong evidence that China has deployed anti-ship missiles, surface-to-air missile systems and electronic jammers to contested features in the Spratly Islands region of the South China Sea. Logan said China's landing of bomber aircraft at Woody Island has also raised tensions. "While China has maintained that the construction of the islands is to ensure safety at sea, navigation assistance, search and rescue, fisheries protection and other non-military functions, the placement of these weapon systems is only for military use," he said. The Pentagon called on China to remove the military systems immediately and to reverse course on the militarisation of the disputed South China Sea features. "We believe these recent deployments and the continued militarisation of these features is a violation of the promise that President Xi made to the United States and the World not to militarise the Spratly Islands," Logan said. Separately Congressman Mac Thornberry, who is Chairman of the House Armed Services Committee, said this year's National Defense Authorization Act or NDAA prioritizes military readiness and strengthens key partnerships while also underscoring that the long-term strategic competition with China is a principal priority for the US. The NDAA bolsters the Department of Defense's efforts to plan for and provide the necessary forces, military infrastructure, logistics capabilities and bilateral and multilateral training in the region through the Indo-Pacific Stability Initiative. It invests in critical military capabilities to deter aggression and respond rapidly to crisis and supports strong missile defense systems to counter North Korea's nuclear and missile programs, including the DoD's development of new capabilities and efforts to provide for a layered defense of the homeland. The NDAA as passed by the House Armed Services Committee renames the US Pacific Command to US Indo-Pacific Command to emphasise the Commands' responsibility across the Pacific and Indian Oceans and requires the Department of Defense to conduct a study on the operational requirements needed for language expertise in Korean, Chinese Mandarin and Russian, and a plan to address any shortfalls.